According to Dr. J.S. Edwards, Ph.D. and his website “Some Grey Matter“, this portrait owned by the Lord Hastings and now at Seaton Delaval, in Northumberland, is a seventeenth-century copy of a sixteenth-century original formerly in the Royal Collection but lost in the dispersals of 1651-52. The painting was originally held at the seat of the Hasting family in Norfolk, but was moved. Though long thought to depict Lady Jane Grey, it has recently been relabeled by the National Trust as Katherine Parr. The “Melton Constable” portrait; courtesy of Dr. Edwards, Ph.D. Detail of the “Melton Constable” portrait; courtesy of Dr. Edwards, Ph.D. 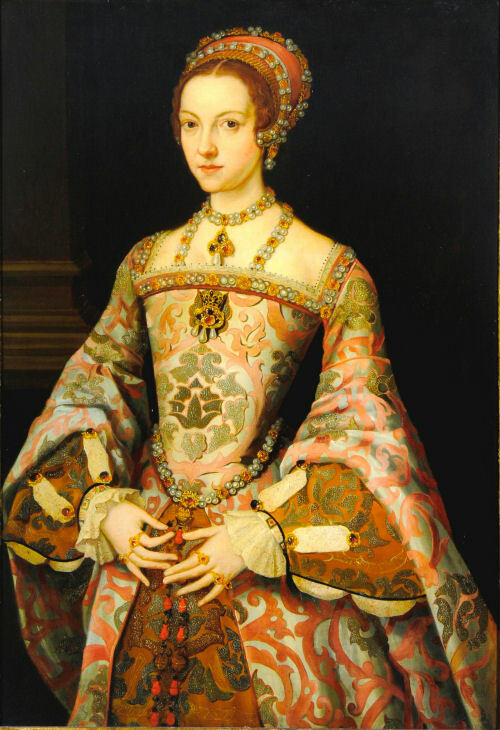 Detail of the girdle which is similar to that of Queen Jane Seymour’s in her painting by Hans Holbein; courtesy of Dr. Edwards, Ph.D.
You will note that the painting is owned by the Barons Hastings. The 1st Baron was Sir William Hastings, husband to Lady Katherine Neville as her second husband. Lady Jane did not descend from the 1st Baron Hastings, but from his wife’s first marriage to Lord Harrington (Sir William Bonville). However, Parr’s great-grandmother, Lady Alice FitzHugh (Neville), was sister to Lady Katherine Hastings. This entry was posted in Life as Queen (1543-1547), Reviews of Media: Queen Katherine Parr and tagged Hastings Portrait, Identity of sitter, Lady Jane Grey, Lord Hastings, melton constable portrait, National Trust, not lady jane grey, portrait of catherine parr, portrait of katherine parr, Some Grey Matter by tudorqueen6. Bookmark the permalink. True, but the painting was originally at the estate in Norfolk. Thanks for pointing that out however.